This opera, which Rossini regarded as the summit of Donizettis achievement, was composed in six weeks. It was first produced at Naples in 1835, was received with enthusiasm, and soon became popular throughout Europe. The libretto, "fierce and tragic," is an Italianised version of Scotts "Bride of Lammermoor," and follows the novel pretty closely. 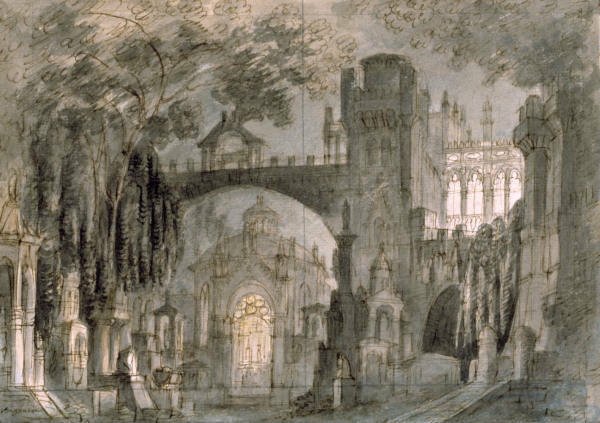 The set design for Donizetti's opera, Lucia di Lammermoor, Act 3, Scene 3, in a production dated circa 1844. Designer: Francesco Bagnara. Sir Henry Ashton, Lord of Lammermoor, wishes his sister Lucy to marry Lord Arthur Bucklaw, for financial and political reasons, though she is engaged to Edgar of Ravenswood. By means of a forged letter Bucklaw deceives Sir Henry into believing that Edgar, the heriditary enemy of the family, loves another. Lucy therefore consents to marry Bucklaw. As she is signing the contract, Edgar suddenly appears and reveals the truth. Lucy, mad with grief, kills Bucklaw, and on recovery dies of horror at her crime. Edgar, hearing of the calamity, plunges the dagger into his breast and ends his existence. This is a variation from the novel, where Edgar loses himself on the seashore and is drowned. The part of Lucia used to be beloved by all the operatic light sopranos, and, in the days of the great tenors, that of Edgardo was even more popular. "When the Lucia of the evening is Patti, Nilsson, or Albani," wrote Mr. Sutherland Edwards thirty years ago, "and the Edgardo is no one in particular, the final scene falls flat; no one, indeed, stops to hear it. But the case was quite different when the part of Edgardo was filled by a great dramatic vocalist like Duprez, or in later days by Mario." 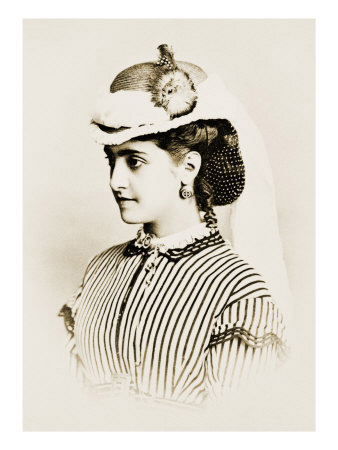 "Lucia di Lammermoor" (Lucy of Lammermoor) was for many years one of the most popular works at Covent Garden, but it has now "come down to the level of a mere prima donnas opera, to be revived once or twice a year in order to give a popular singer an opportunity for vocal display." Some of its melodies can only be described as sugary, but others are fresh and expressive. Here and there are passages of real dramatic power; notably the sextet in the second Act, "Chi me frena," and the lyrical lament in which Edgar invokes the spirits of his forefathers. The dramatic finale at the end of the second Act is broadly conceived and well constructed. Size: 9 in x 12 in.